Trail mix. Image source: Pixabay. While the term “heterogeneous mixture” sounds like it could be a complicated concept, in reality, it is actually quite simple. A mixture is made up of two or more substances, and in a heterogeneous mixture, those substances are not uniformly distributed, meaning that the substances that make up the mixture can be distinguished from one another upon examination. Image by John Trombley [CC BY 4.0], from Wikimedia Commons. Mixtures can be either heterogeneous or homogeneous. Unlike a heterogeneous mixture, a homogeneous mixture is a mixture that is uniform throughout; this means that the different components of the mixture cannot be distinguished from one another in some way. A heterogeneous mixture can be separated mechanically, meaning that you could physically separate the individual components of the mixture using a pair of tweezers, or a magnet, or a filter, or some other tool. A homogeneous mixture, however, can only be separated using chemical means. An example is salt water: if you want to separate the salt and the water, you must evaporate the water away in order to be left with water-free salt. 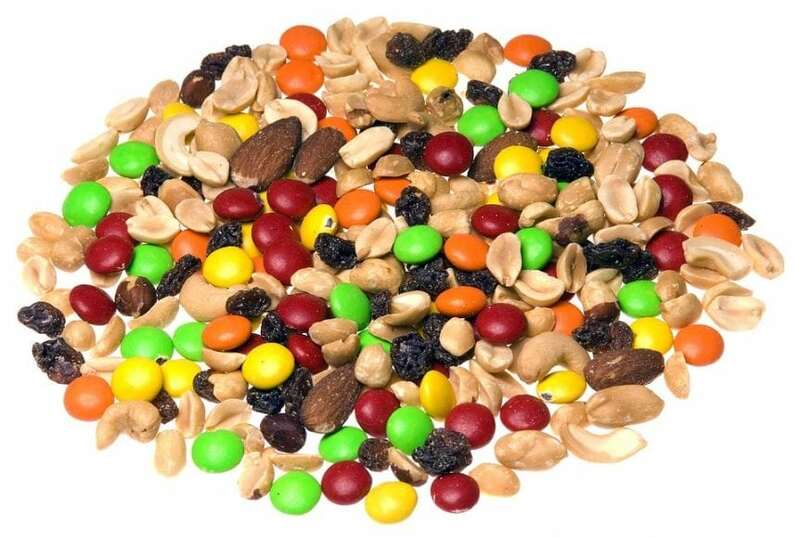 A heterogeneous mixture is often composed of different solids, or of matter existing in two or more different phases. Phases are states of matter; there are three well-known phases, gases, liquids, and solids. (A less well-known phase is plasma which is a gas that is so hot that it has enough energy for some electrons to leave their atoms; the sun is made of plasma). There are some specific terms for heterogeneous mixtures that are used to describe mixtures of phases or immiscible (do not mix) liquids. A heterogeneous mixture made of different phases is generally called a suspension. Often one of the phases is solid while the other phase is a liquid or a gas. The solid portion of a suspension does not dissolve into the liquid or gas portion and may float or sink in the liquid depending on density. When agitated by mixing or shaking, the solids in a suspension can be more evenly distributed throughout the liquid, but given time, will separate. An example of a solid and liquid phase suspension is mud. Another type of suspension is called an aerosol, which is where small liquid droplets or small solid particulate is suspended in a gas. When liquids that do not mix form a mixture (weird, I know), it is a heterogeneous mixture called an emulsion. In an emulsion, one liquid is dispersed evenly as small droplets throughout another liquid. These liquids may separate when left to stand, much like a suspension. An example of an emulsion is a vinaigrette dressing, which is a mixture of vinegar and oil. 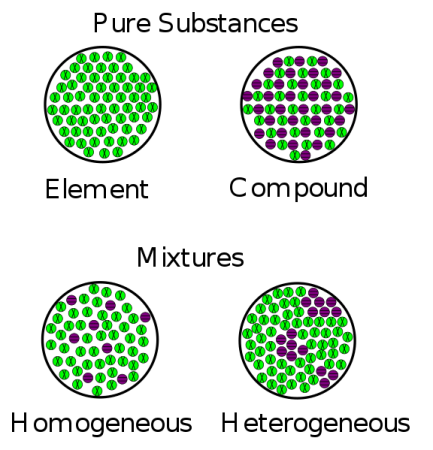 Heterogeneous mixtures can be turned into homogeneous mixtures sometimes. There are a few different ways of making this happen, including melting and stirring or allowing diffusion to mix the liquid sample well enough that all parts become uniformly distributed. Making a heterogeneous mixture into a homogeneous mixture is a process called homogenization. A familiar example of homogenization is homogenized milk. When milk has been homogenized, the fat globules in the milk are reduced in size so that they are able to stay suspended in the rest of the milk don’t separate when the milk is left to stand, making the milk no longer a suspension but a colloid. Milk that has not been homogenized will separate into layers of fat (cream) and the rest of the milk. Homogenization is also important when collecting a sample of something that will be analyzed. 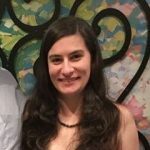 It is important that the material is homogenized in order to ensure that when the sample is taken, it will be an appropriate representation of the whole material. For example, if a bowl is filled with a bunch of differently colored candies and you want to know the proportions of each color of candy in the bowl, you need to take a sample and count out how many candies of each color there are. If you grab a handful of candy from a bowl that has not been homogenized, then you might grab a bunch of candies that are mostly green and blue. But if, when you look into the bowl, there aren’t mostly blue and green candies, then your sample didn’t accurately represent the whole material and you just happened to get a handful of candies from the blue and green area of the bowl. Obviously, it isn’t super important to know how many candies of each color there are in a bowl, but it’s an example that is easy to visualize. Heterogeneous mixtures are found virtually everywhere, not just in a science laboratory. You’ve probably gone on a walk or a hike somewhere and brought a bag of trail mix from the supermarket bulk bins with you. It’s tasty, easily portable, and definitely a heterogeneous mixture. 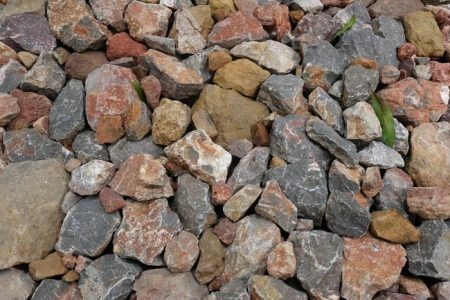 Gravel, made up of a whole bunch of different colors, sizes, shapes, and textures of rocks, is a heterogeneous mixture. Do you cook? Already you are making a heterogeneous mixture if you do. 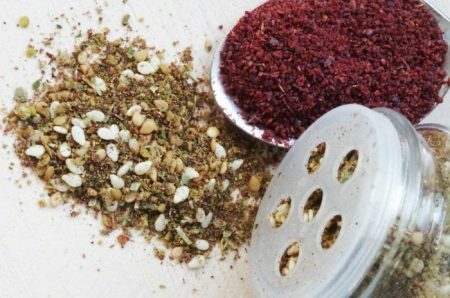 Likely you have made or purchased a spice mixture like the one seen below. Just by taking a quick glance at the photo below you can see individual parts of the spice mixture, and you know that it is heterogeneous. Spice mix. Image source: Pixabay. A classroom full of children is a heterogeneous mixture. So is a salad, made of ingredients like lettuce leaves, tomatoes, carrots, and cucumber, or a bowl of cereal with each piece of cereal floating in milk. Dirt and sand are heterogeneous mixtures; if you look at some dirt or sand under a microscope, you will be able to see different pieces of material that make up the sample. Have you ever looked at a drop of pond water under a microscope? The small splash of water is full of bits of plant matter and fun little creatures that live in the water, like amoebas, paramecia, and Euglena. How many examples of heterogeneous mixtures can you think up?